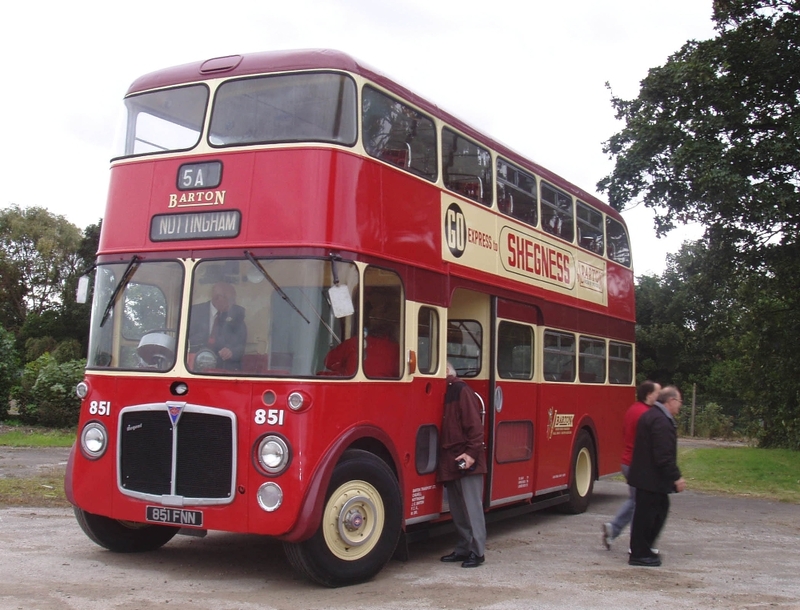 Maidstone and District was an early user of the Leyland Atlantean, taking both normal and lowheight examples classified DH and DL respectively, from 1959 until 1963, when the Daimler Fleetline became the favoured choice. CRG6LX No.DL76, 76 YKT was delivered in September 1964. The Northern Counties body is shown as H44/35F on BLOTW but elsewhere is stated to be H44/33F. DL76 is seen in Tonbridge on 1st October 1967 by which time the BET was concluding negotiations with a view to the sale of its bus industry interests to the government. The imperfect state of the front panel of DL 76 indicates some prescience of the future world awaiting it under NBC. H44/33F seems more likely. The first Atlanteans of my local BET operator, Tynemouth and District had H44/34F seating, reduced on the next batch of Atlanteans, and the first batch of Daimler Fleetlines to H44/33F. This was achieved by reducing the inward facing seat over the front wheel arch from 3 to 2. 34 seems to be the maximum that could easily be fitted in downstairs, 35, although not impossible, would imply very cramped seating. Roger, I would interpret the bent front panel another way – all was not perfect before National Bus company was formed whatever some fondly like to remember! Had it not been formed I would not have arrived at M&D from Eastern Counties in January 1970! It is perhaps an appropriate location to remind us of Mr Macawber: Annual income twenty pounds, annual expenditure twenty pounds ought and six, result misery! Perhaps the main reason BET were willing to sell out! 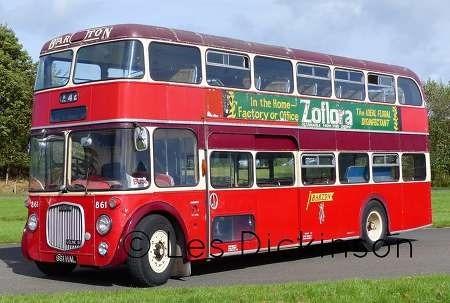 At that time all the M&D Fleetline DD were 77 seaters as indeed were the highbridge Atlanteans (according to the 1971 fleet list). DL 76 > 6076 was still at Tonbridge in 1971 having been converted to "OMB" as was the current expression. Tonbridge had no bodybuilders and had a small running shift, so it was no doubt waiting to go to Tunbridge Wells for repair – the dreadful split level garage that was eventually closed only in 2017! Northern Counties made one of the best jobs of bodying the first generation rear engined buses. The engine shrouds hide the rear end bustle and the proportions look just right. In this instance the whole show was helped by a tasteful traditional livery that fitted the lines of the body. Although a bit boxy I thought the flat screens were better than the later versions where BET style curved windscreens were grafted on and never seemed to blend in right. Nice looking bus, the livery helps. We had similar at PMT new in 1963. They were specified with a seating material called Replin which quickly became very soiled and were later retrimmed in very basic red vinyde. I prefer the M&D single headlamps to the twin headlamps fitted to the PMT batch. I like the Southern Region green Station nameboard! Not being familiar with the M&D fleet, I’m assuming that the prefixes DL and DH referred to the overall height rather than the upper-deck seating layout, hence the Fleetlines were DL as they had the drop-centre rear axle. The old M & D garage at Tunbridge Wells was originally operated by Autocar and was in existence prior to 1933 when London Transport expected to acquire it(they had to make do with the little garage in Whitefield Road which became the operating base for Greenline 704)The garage faced directly onto the main road and also Woodbury Park Road.Why do todays operators consider covered accommodation unnecessary? A quick reply to Geoff Kerr; DH referred to ‘Diesel Highbridge’ and DL to ‘Diesel Lowbridge in the Maidstone & District fleet. I was not a lover of the Fleetline because, as a driver, I found the engine tended to resonate through the bodywork into the cab and would give me a severe headache after an hour! That is if the engine was not perfectly tuned and many ‘bus engine was not perfect! I also once had the misfortune to have an engine cowl corner fall away from the body and dragged it along road by the cables when returning to Maidstone from West Malling. The ‘D’ stood for ‘Double Deck’, not ‘Diesel’, Freddie. The corresponding Single Deck code was ‘S’. Having known many M&D staff over the years I can say that TW was not very good at looking after vehicles. Many were the PD2s and Reliances that managed to mysteriously get to Brighton so that Edward Street fitters could do a brake reline or other maintenance task that TW didn’t want to do. It was very noticeable in old M&D days that the vehicles from GR & H would be very well looked after, whereas TWs looked like bumper cars. 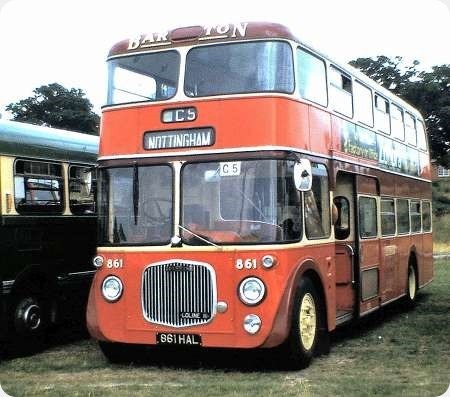 During the mid-1960’s with the recent arrival of Geoffrey Hilditch as General Manager at Halifax Corporation, the Joint Omnibus Committee had begun to develop its tour and private hire operations, acquiring a number of secondhand coaches to that end. A works contract had been obtained requiring a number of coaches to provide transport between the smaller towns within the Wakefield/Barnsley/Doncaster triangle and Meredith & Drew’s biscuit factory at Ovenden in Halifax. 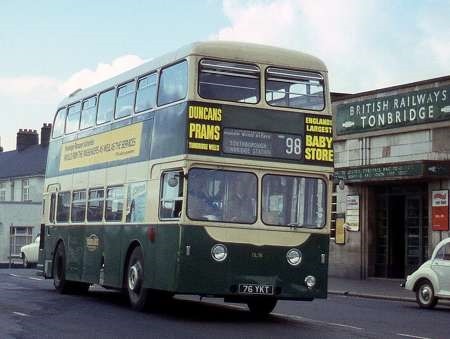 Other private hires – such as to away rugby league fixtures – and the popular local afternoon countryside tours often required several coaches or DP’s and it was reckoned that economies could be made if a lesser number of suitably comfortable and speedy low-height double deckers could be provided. 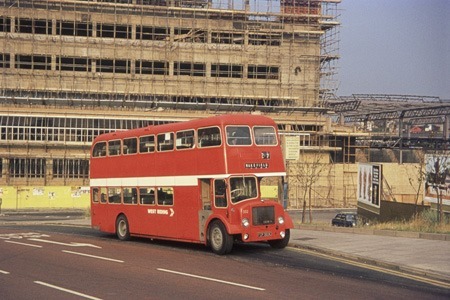 At the time the double deck buying policy had switched from Leyland Titan halfcabs to Daimler Fleetlines, but the latter though available in low-height form came with four-speed gearboxes and were only capable of a top speed of around 42 mph. A Dennis Loline III demonstrator had been amongst many other types trialled in 1964, but although it had the preferred semi-automatic gearbox it too had only four speeds, but enquiries were made about the possibility of providing a five-speed version and after further trials of the same demonstrator an order was placed for what would turn out to be the last batch of Lolines to be built. Delivered in February and April 1967 they were numbered 300-304 (FCP 300-304E) and had Gardner 6LX engines, five speed semi-automatic gearboxes and smart Northern Counties H41/33F bodies with all moquette higher-backed seating. They were most impressive vehicles to ride on and could certainly get a move on. They enabled the M&D contract to be worked by fewer vehicles at a more competitive price and were regularly used on tours, private hires and service work alike. Much has already been written elsewhere about the unfortunate unreliability of the complicated and cramped transmission involved, so I won’t go into further details here, but it was a shame as the Loline as such was an otherwise excellently engineered and quality machine. Within four years though the engineers had had enough of their problems. West Riding Automobile was desperately attempting to rid itself of its disastrous Wulfrunians and buying all the Bristol Lodekkas it could lay its hands on. The Loline was essentially based on the Lodekka and so Hilditch spotted an opportunity to be rid of them whilst they could probably still command a decent price and in due course all five became West Riding’s 464-468 (later 549-553), at first painted in their latter Tilling Green and cream livery, but by the time of this photo – taken in Hall Ings, Bradford in 1975 – they had become NBC poppy red. One was withdrawn for spares in 1973, and the others were sold to North’s the dealer in 1977, and scrapped the following year. I never rode on these Halifax Lolines, as I (utterly unregretfully) left my job at HPTD Traffic Office towards the end of 1966, but I did spot them about on my occasional visits in the years immediately following. Some other Lolines and a number of FLF Lodekkas also had semi automatic gearboxes which seem to have run satisfactorily in service, though I believe that all these were four speed units. As John says, the Halifax Lolines were SCG five speeders, and the problems seem to have dwelt therein. Given the fact (from GGH himself) that they were capable of ‘well over’ 50mph with the 1700rpm 6LX, it is clear that they were obviously very highly geared indeed in fifth. This would have stressed the transmission components considerably, especially in the challenging Halifax operating environment. Certainly the trouble free Aldershot and District constant mesh five speeders were no sluggards, even with the 6LW engine, though, with a top speed of about 50mph, they were not as highly geared as the Halifax examples. In his book "A Further Look At Buses" Hilditch lists the production of the various Loline models, but mistakenly shows the Reading Mark III machines as having semi auto gearboxes. They were constant mesh, the first batch having four speed Dennis boxes, while the later ones had five speed Bristol units with fifth gear blanked off (a decidedly curious arrangement). Incidentally, the location of John’s photo seems to be that of my last picture in my West Riding Wulfrunian gallery, but I see that the fine Victorian building in the background has been superseded by a ‘modern’ architectural excrescence. I believe the Eastern National semi auto FLFs were 6LX/five speed. The Crosville semi autos were also five speed, but had the less powerful 6LW, which would provide less stress for the transmission. I have never heard of either of the above types being particularly troublesome, so the answer may have had something to do with the Halifax Lolines higher (?) gearing. I remember the Halifax Lolines very well and I remember going on a countryside tour to Delph on one. To me they represented the ultimate half cab D/D development ie Gardner 6LX engine, 30 ft in length, semi automatic gearbox and nice airy interior, a great pity they were flawed. What a surprise I got when I read Andrew Spriggs’ comment above, and found mention of my home village of Delph. Not often mentioned in bus circles, but featured in the film ‘Brassed Off’ when the band plays at the Whit Friday Contests. My family ran the village Post Office in Delph for a number of years, and the Halifax buses on the Day/Afternoon Excursions used to stop right outside, so the passengers could stretch their legs and have a wander down by the River Tame, and possibly have a beverage (or two), in one of the 4 pubs. The White Lion being run by Sonny Ramadhin a West Indian cricketer of some renown in the 1950s and 60s. I recall a number of vehicles being used including Lolines, PD3s, and later Fleetlines, along with single deckers if the loadings were not overly generous. 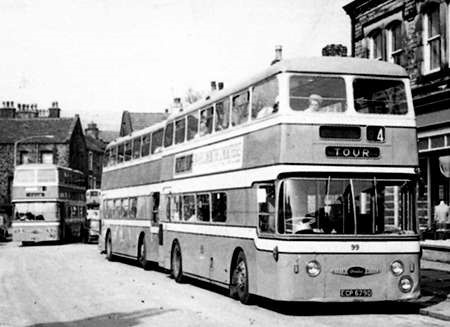 Delph, and Saddleworth was of course no stranger to Dennis Lolines, as the local operator, North Western Road Car Company, ran a large fleet of them. Delph was of course the home of one Geoffrey Hilditch for a number of years, and I think the area made a lasting impression on him, as he is buried in the Grave Yard of Denshaw Church, which is the next village up the valley. Anyway enough of my ramblings, and attached is a picture which was sent to me a number of years ago, of 3 Fleetlines in Delph (King Street), on the said Excursions. The Post Office is situated just out of shot to the right, and if shown, would probably show me hanging out of the flat window on the top floor.